Window felt kit. 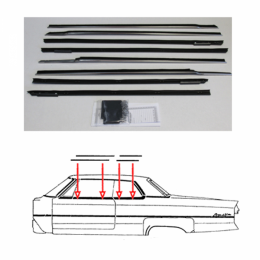 Complete 8 piece kit for inner and outer on all 4 doors. Sometimes called "window sweeps" or 'beltline seals." Pre-cut and pre-formed to the proper length & shape for your vehicle. Correct material for both inner and outer seals. Top quality reproductions. MADE IN THE USA.